This article in the February CI&M by Jim Hayes of FOA helps contractors understand OLANs and how they will affect their business. A MUST READ for contractors. Use these links to read previous issues or use FOA's Google Custom Search to look for specific topics on our website. Este libro es una guía de diseño e instalación para redes de cableado con fibra óptica. Fue escrito como un libro de referencia para los instructores y estudiantes en clases para certificación CFOT FOA, así como una referencia para cualquiera que trabaje en el campo. Este libro ofrece una cobertura amplia de los componentes y procesos de fibra óptica que se utilizan en todas las aplicaciones y prácticas de instalación. La guía básica de fibra óptica de la FOA ha sido traducida al español. Es la versión completa de la FOA Guía básica Online traducido por especialistas técnicos, incluyendo todos los dibujos. Por favor, lea o comprar una copia del libro impreso y nos dan su opinión sobre cómo podemos mejorarlo! Si usted está enseñando a la fibra óptica, póngase en contacto con nosotros ya que estamos ahora traduciendo el programa de formación FOA CFOT también. If you are teaching fiber optics, contact us as we are now translating the FOA CFOT training curriculum also. About the same time Google Fiber started signing up customers in Provo, Utah, (Customers can now go to the GoogleFiber Provo website, enter their address and find out which of the “fiberhoods” their home is in. ) and announed the sale of Motorola Mobility, the cellphone manufacturing company they bought earlier, the company revelaed plans to consider Google Fiber in 34 more cities. Technically, one should say 9 metropolitan areas that include these 34 cities, but it's impressive as it covers some large metro areas. If you add Kansas City (2.0million), Austin (1.8million) and Provo (included in Salt Lake City), you are approaching coverage of 10% of the US! In the announcement by Milo Medin on the Google blog, they state that these networks are not yet certain to be built: "While we do want to bring Fiber to every one of these cities, it might not work out for everyone. But cities who go through this process with us will be more prepared for us or any provider who wants to build a fiber network. 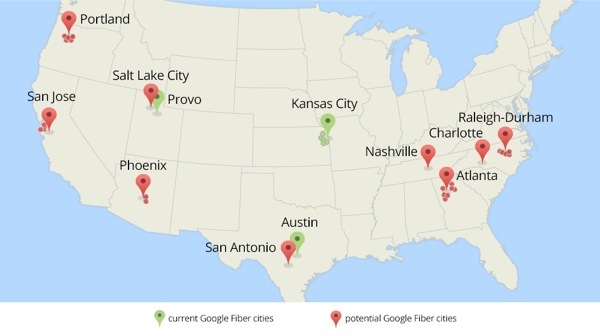 In fact, we want to give everyone a boost in their thinking about how to bring fiber to their communities; we plan to share what we learn in these 34 cities, and in the meantime you can check out some tips in a recent guest post on the Google Fiber blog by industry expert Joanne Hovis. Stay tuned for updates, and we hope this news inspires more communities across America to take steps to get to a gig." But the fact that Google is interested indicates that Google Fiber has a business model that makes money offering Gb FTTH, something which may interest other investors and cities considering building their own systems. 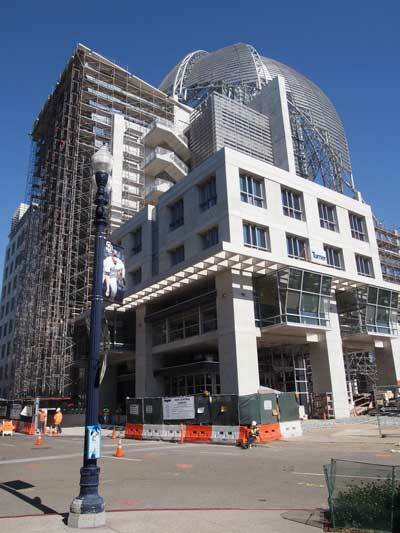 And, by the way, they are already looking at boosting Google Fiber to 10Gb/s! UAE-based Etisalat’s Dh19 billion ($5.17 billion) investment in the fiber to the home (FTTH) network has made the Emirates a global leader in connecting homes in the country, according to a recent industry report. UAE has taken the lead with a penetration rate of 72 per cent, according to the annual study conducted by Panorama Research on the Global FTTH market for the FTTH global council. The ranking covers all countries with at least 200, 000 households where the penetration of FTTH has reached 1 per cent of total number of homes. This year, 36 countries were members of the global ranking with UAE taking the lead at a bigger margin to South Korea, the nearest competitor at 57 per cent of homes subscribing to FTTH. The other countries close to this penetration were Japan, Russia, US and South France. A significant achievement for Etisalat is that it took the prime role in financing and executing the FTTH project, a statement from the company said. Etisalat Academy, the training organization for the company, is an FOA-Approved school training their personnel and contractors in fiber optics and FTTH. 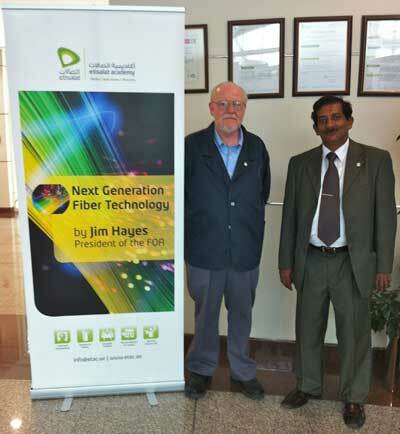 FOA President Jim Hayes and Zenon De Silva of Etisalat Academy at a FOA seminar in Dubai in May 2012. The TR-42.11 standards committee received a request from the IEEE 802.3 Ethernet committee to harmonize the return loss specification of single-mode fiber connections with that of ISO/IEC 11801 from a minimum of 26 dB to a minimum of 35 dB. The proposed revision of TIA 568, TIA-568.3-D, the document in which the return loss parameter is specified, is currently in being voted on. TR-42.11 accepted these comments at their meeting in Fort Myers, FL on January 28, 2014. TIA-568.3- D remains under revision within the ballot process and will not publish within the next six months. This is a good idea because short premises links are sensitive to reflectance. It is advisable to use this as a minimum for new SM networks such as those being installed for OLANs. Project PWI 86C-19 Ed. 1.0 which should lead to IEC/TR 61282-14 when completed: Fibre optic communication system design guides - Part 14 : Determination of the uncertainties of the attenuation measurement of cable plants. Pound for pound, wet-spun carbon nanotube-based fibers have greater capacity to carry electrical current than copper cables of the same mass, according to new research. While individual nanotubes are capable of transmitting nearly 1,000 times more current than copper, the same tubes coalesced into a fiber using other technologies fail long before reaching that capacity. But a series of tests shows the wet-spun carbon nanotube fiber still handily beat copper, carrying up to four times as much current as a copper wire of the same mass. 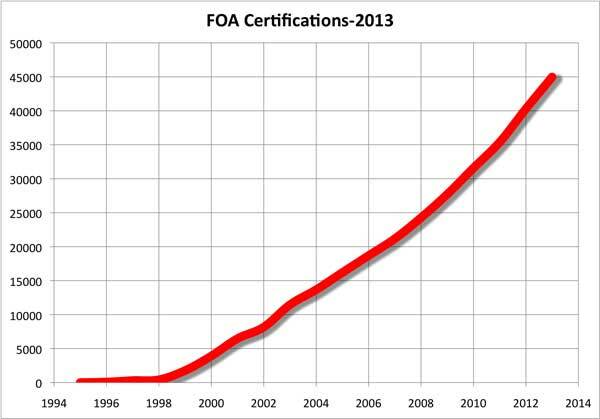 FOA certified a record number of CFOTs and CPCTs in 2013. We've now certified over 45,000 techs that are working worldwide to build the fiber networks that make commumications work! Great job everyone! FOA has added a new Fiber U self-study program on Optical LANs (OLANs). As you know, this is a hot topic in the IT world, so FOA has created an online course that allows you to study about OLANs (FOA includes fiber to the desk, fiber to the office and passive optical LANs) on your own time and schedule. You will be guided to material to read, videos to watch and even have quizzes to check your comprehension. The page on Optical LANs (OLANs) has been expanded to 5 pages with new material and links. Tapping fiber has become a big topic in the news. How do you tap fiber? OLANs are probably the most important new technology for enterprise networks since the introduction of structured cabling standards 22 years ago. For the last few months, FOA has been working with companies and groups interested in OLANs to create a certification for techs designing and installing them. With OLANs, FOA has worked with leaders in the field to create technical materials on our FOA Guide website, Fiber U self-study program and YouTube channel already. We now have a curriculum ready our FOA-Approved schools which will make OLAN training available for those interested. Read More. Tellabs has also posted a number of very interesting videos on the library. Over the last couple of years, we've written a lot about Optical LANs, either based on FTTH passive optical network (PON) or point-to-point (P2P) Ethernet architecture. The more we see of these types of networks, the more we appreciate their design and economy. But how about scale - how big can they get? Working with fibers the size of the human hair and light invisible to the human eye makes fiber "mysterious" and hard to understand. Drawings on how things like fiber work can provide a level of understanding, but nothing beats seeing it for yourself. After a lot of experimenting, we have come up with one solution that allows us to demonstrate how fiber works via "total internal reflection," how fiber attenuation is caused by scattering and how it is dependent on wavelength and how connector loss happens. The secret to making it visible is to use a green laser pointer instead of the more common red one. In the plastic rod we used to simulate optical fiber, the scattering of the green laser pointer is much higher than the scattering of a red laser pointer, making it much more visible. This is, of course, exactly what we teach students - longer wavelengths of light (redder, right?) have less scattering and therefore less attenuation. If you teach communications or IT to high school or younger students, you can use these videos to show how fiber works and, if you are interested, duplicate these experiences in your classroom. FOA gets lots of calls and emails from our members looking for information about where the jobs are and how to train for them. 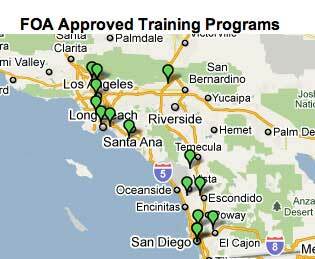 FOA has created three ways to help you find jobs, train for them and apply for them. FOA has created a 20 minute YouTube video that talks about all the applications for fiber optics, what jobs are involved and the qualifications for the workers in the field. Besides telecom and the Internet, we cover wireless, cable TV, energy, LANs, security, etc. etc. etc. It's a quick way to get an overview of the fiber optic marketplace and we give you an idea of where the opportunities are today. Watch the new FOA YouTube Video: Where Are The Jobs In Fiber Optics? Cabling Project Management - FOA has created a new YouTube video on what's involved in a cabling (copper/fiber/wireless) project with advice for both the customer and the contractor involved in a cabling project. The intent of this video lecture is to help customer and contractor communicate effectively on a new project. Fiberizer Cloud – fiber optic testing data management solution in the cloud. The new web service Fiberizer Cloud was developed from the view point of ordinary fiber optic engineers and their businesses. Now engineers have no need to store multiple copies of their OTDR traces on different PCs in tremendous number of nested folders; or to order expensive custom software. Fiberizer Cloud allows to store and analyze fiber optic testing data directly from the browser . By Patrick McLaughlin, Chief Editor. This webcast, produced and delivered by Cabling Installation & Maintenance, will go into depth on the practicalities of deploying a POL. In addition to discussing the technology’s history as a FTTH architecture and its applicability to enterprise environments today, the seminar will address considerations that must be made when an organization decides to implement a POL. In this webinar, learn about INTERCEPTOR and Alarmed-Armored PDS; an authorized PDS option that, since 2003, has been deployed across the globe to protect U.S. government classified networks up to the TS/SCI level, including SIPRNet, JWICS, and in high threat level environments. Learn how to design Secure Passive Optical LAN architectures by adding optical network monitoring products and secure layer-one products. Secure PON delivers unparalleled performance and security. Here is the announcement and link to sign up. With bandwidth demands on enterprise networks increasing, network managers have begun to rely more heavily on fiber. Passive optical local area networks (LANs) have emerged as a particularly strong option for building and campus applications as a future-proof way to meet very high bandwidths today or to ensure an smooth evolution toward future all-fiber enterprise networks. This special webinar by Lightwave again confirms the rising popularity of Optical LANs (OLANs) based on FTTH technology and emphasizes the importance of the new FOA OLAN training and certification. *If you are not fluent in English slang, that means it's "hot" or very popular! Go here to see the seminars offered. Available for comment is a new proposed standard for Datalinks. The FOA has many videos on YouTube, including two Lecture Series (Fiber Optics and Premises Cabling), Hands-On lectures on both and some other informational and instructional videos. For all the videos, go to the FOA Channel "thefoainc" or use the direct links below. Below is a list of all the current lectures and hands-on videos. We're looking for ideas for topics for future lectures. Send your ideas to <info@thefoa.org>. Christiansted, St. Croix Virgin Islands, U.S.
Q: I have an existing light blue, 50 micron, armored fiber cable, with 3 pairs, between data closets. The first pair is used successfully with my 10 GB data network, using all 50 micron patch cables and connectors to Dell Force 10 switches. My issue is with a secondary network. I would like to utilize a second pair on the 50 micron riser. But, the patch cables from each side will be 62.5 microns (orange) cables that go into my HP switches, with 1GB connectors. I know mixing 50 to 62.5 is NOT best practice according to your site (http://www.thefoa.org/tech/fib62-50.htm), but I have tested the connection from 1 HP switch to the other, utilizing the 62.5 micron patch cables, into the 50 micron uplink, with success. Should this even be working? Is it strange that it works at all? If not, should I be even more concerned, if I connect 48 people using this same scenario? A: This is a common problem. There is an explanation and two solutions. Explanation: Every link has some margin for optical power - that is it has more power at the receiver than the minimum required. The link where you have Trans>62.5>50>62.5>receiver fiber will has a higher loss at the 62.5>50 connection near the transmitter and a lower loss (even than connections of two fibers the same size), since the larger fiber on the receiver end negates the losses due to most alignment factors - big to small means very low loss. Since the link works, the excess loss at the 62.5>50 connection near the transmitter is compensated by the lower loss of the 50>62.5 connection near the receiver and is within the original margin of the link. Thus it works. Soution #2, replace the patchcords with 50/125 patchcords, since there may be a slightly lower coupled power from the transmitter, but not much since both are VCSELs* with similar power outputs, and the receiver will pick up all the light. In other words, using 50/125 patchcords will probably have higher margin. * Since fiber networks moved to gigabit speeds, the old LEDs used at 100Mb/s were unable to cope, so everybody switched to an inexpensive laser a VCSEL - vertical cavity surface emitting laser - that launches power in a very narrow beam in the center of the fiber, smaller than a 50 micron core and way smaller than a 62.5 micron core. http://www.thefoa.org/tech/ref/appln/transceiver.html Thus there is no penalty to using the smaller fiber at the transmitter end. We recommend you try #2. Q: I am or was about to run Cat6 Ethernet cable through my house. Granted it would do the job. Having come across your organisation and brilliant website, I have started to think about a fibre install. Could you help with some suggestions as I find the difference between cables confusing. A: Certainly you can install fiber in your home. See Fiber Optics in Premises Cabling. Best choice would be 50/125 multimode fiber, type OM2 or OM3. But to connect devices you will need media converters (Media Conversion) which will convert from fiber to the Ethernet ports designed for Cat 6. Fiber makes a nice showcase but is overkill for most homes. Q: Is there test equipment in the market that can do latency test (time of flight) on fiber optic cable? I have the formula for the calculation, Distance x Refraction Index / Speed of Light. Is there test gear to prove that we have met or are close to meeting the specs? A: Use an OTDR. Measure the distance and use the index of refraction programmed into the OTDR to make the calculation of time of flight. Q: We have a system currently that is comprised of OM2 fibre with LED transceivers. There is a proposal to change the fibre to OM3 and I have been asked to look at how the change will affect the transceivers currently fitted which will remain the same until a later upgrade. From looking around on various forums I can see that OM3 is optimised for lasers, however the existing hardware will remain as LED. My understanding is that OM3 is simply fibre manufactured to a better standard than OM2 with significantly less internal defects. This leads me to think that switching from OM2 to OM3 fibre would not have any negative effect on the existing hardware and would probably reduce the overall link loss. I am also looking at whether we can use the same connectors, again looking on the internet I can see that the physical dimensions are the same, however are some connectors only certified to OM2? A: The difference between OM2, OM3 and OM4 fiber is the "modal" bandwidth potential of the fiber at 850nm. OM2 and OM3 fiber is optimized for bandwidth with 850nm VCSELs and has no bandwidth advantage with 1300nm LEDs. The optimization is done by more careful manufacture of the graded index profile of the core of the fiber, nothing else. There is no reason to use OM3 or OM4 fiber with an LED transceiver as the LED cannot be modulated at high speed and the LED bandwidth in any of these fiber is limited by chromatic dispersion which is not significantly different in any of the higher grade fibers. The attenuation coefficient of these fibers is not enough different to justify replacement either. See http://www.thefoa.org/tech/ref/basic/fiber.html for more info on fiber. They all use the same connectors. 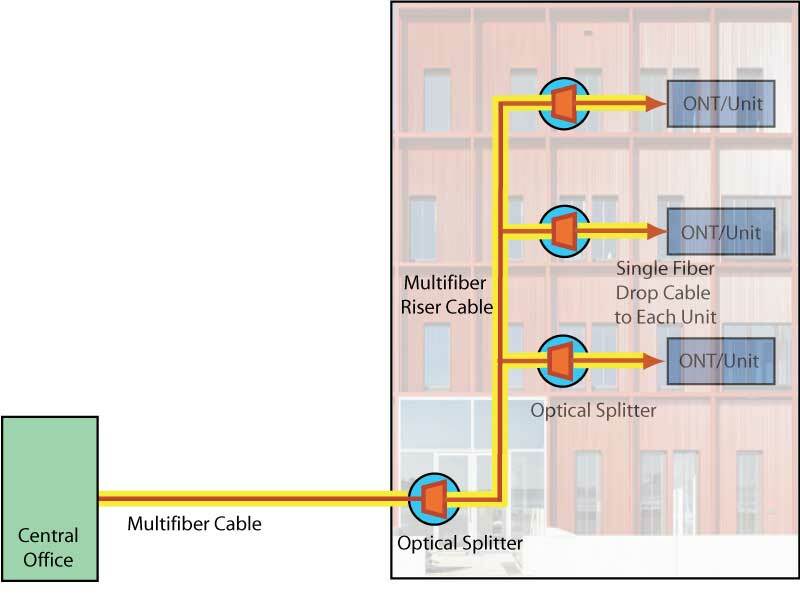 Fiber optic connectors are not a factor in the bandwidth of the fiber. Q: Recently my Company is working on a Project with the need to install Fiber optic cables for our customer. May I know if your Organization has any comparison chart/table for the different types of ferrule used? If yes possible to send it to us? We are looking at the comparison between metal and ceramic in particular. 3. They polish easily and provide a better finish. Metal connectors are mostly used for very high power systems like laser surgery or cutting. In fact one of the most popular one uses no adhesive - it crimps to the fiber. FOA has lots of information on connectors in our Online Guide: http://www.thefoa.org/tech/ref/contents.html#Components - see the “Connectors and Termination” section. Note particularly the information on the different methods used to attach the connectors. Q: How Do You Test Bare Fibers or Unterminated Cables On A Reel Before Installation? A: There are two ways to test the loss of fiber on a reel without connectors. 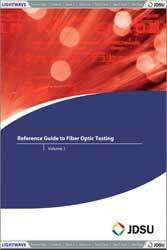 See the FOA page on Testing Bare Fiber. One is to do a "cutback test" using a light source and power meter. It is shown here (http://www.thefoa.org/tech/ref/testing/test/loss.html) in the section "Testing Fiber Attenuation." You also need "bare fiber adapters" which are available from many distributors. The second way is to use an OTDR, a long pigtail (a cable with a connector to adapt to the OTDR and a bare fiber on the far end. It should be fairly long, `1km) and a mechanical splice to temporarily connect to the fiber to be tested. Then just take a regular OTDR trace (see http://www.thefoa.org/tech/ref/testing/OTDR/OTDR.html) and look for the attenuation and any faults in the fiber. Q: Is testing 10g MM fiber is different than testing regular MM fiber? A: Assuming it's OM3 or OM4, it should be tested like other 50/125 fibers - insertion loss. Theoretically, that means that it should be tested with sources or mode conditioners that create a EF launch according to the current TIA OFSTP-14 standard. At the TIA meeting in Philadelphia in October 2013, the TR-42.11 committee responsible for OFSTP-14 agreed to modify the document to require EF only for that case and at 850nm only, not for any other multimode fiber type nor at 1300nm. Data was presented by Fluke that showed that mandrel wrap conditioning would bring most sources into EF compliance. The committee is working toward a solution that calls for a mandrel wrap tested by HOML - higher order mode loss. HOML measures the power before and after the mandrel wrap and looks for a specified power loss due to the mandrel wrap. Q: I am wondering why you would need to perform bi directional insertion loss testing? I would assume that you should get the same results testing from either end? A: That's an interesting question when you are talking about insertion loss. For OTDRs, the answer is obvious - the differences can be quite large due to the different backscatter coefficients of fibers which causes joints to be gainers as much as 1/3 of the time. For insertion loss, the likely directional measurement errors are generally smaller, primarily due to the different conditions of the connectors on the reference cables and the variations in the diameters of the fibers at joints. Those errors may be smaller than some simpler issues like source wavelength, a major contributor for loss variations in long singlemode and most multimode cable plants. By source wavelength, we do not mean 1310nm vs 1550nm for singlemode or 850nm vs 1300nm for multimode, we mean that international specs for test sources allow significant variations, e.g. 1310nm lasers can have wavelengths from ~1280-1330nm and 850nm LEDs can vary from 820-880nm. If you look at the loss variation due to the variation of attenuation coefficient of the fiber, the potential for error is large. In my 30+ years of working with standards committees, I've found that they tend to focus on certain issues and ignore others when writing standards. The committees have, for example, focused on mode-power distribution in MM testing but ignored issues like source wavelength and core diameter (which I have been adamant at presenting data to TIA committees here in the US to point out the real world issues.) Strangely enough, long SM runs are sometimes not even tested for insertion loss. So to finally answer your question, you will likely not get the same result when testing insertion loss in the opposite direction, but the measurement uncertainty due to direction is only part of a larger number of potential errors that probably do not justify the time and cost of bidirectional testing. One could probably argue the same way on OTDR testing, but many people are confused by the large numbers of gainers one sees in a long concatenated link. Dimension Data this week released its annual Network Barometer Report 2013, which evaluates the readiness of enterprise networks to support critical business operations. The announcement, made during the Cisco Live user conference in Orlando, Fla.
You can download the Dimension Data report here. Linden has developed a high temp version of their STFOCTM (a fully polymer cable) that has an operating temperature of >300C. A cost-effective alternative to traditional high temp cables like FIMT & PEEK, High Temp STFOC uses Linden’s existing proven and patented construction. Linden’s LCP layer provides strength & hermeticity and is highly resistant to pressure, radiation & impact. Custom Designs Available. More info. The US Conec IBCTM Brand Cleaners MT series mechanical cleaning tools are designed for cleaning the fiber arrays on MT based connector systems. These tools are capable of cleaning MT based connector systems loaded in a bulkhead adapter, on the card edge, the backplane and on unmated cable assemblies. The IBCTM Brand Cleaners will clean both female (no guide pin) and male (with steel guide pins). These tools will clean both flat polished multimode and 8 ̊ angled singlemode MT ferrules. 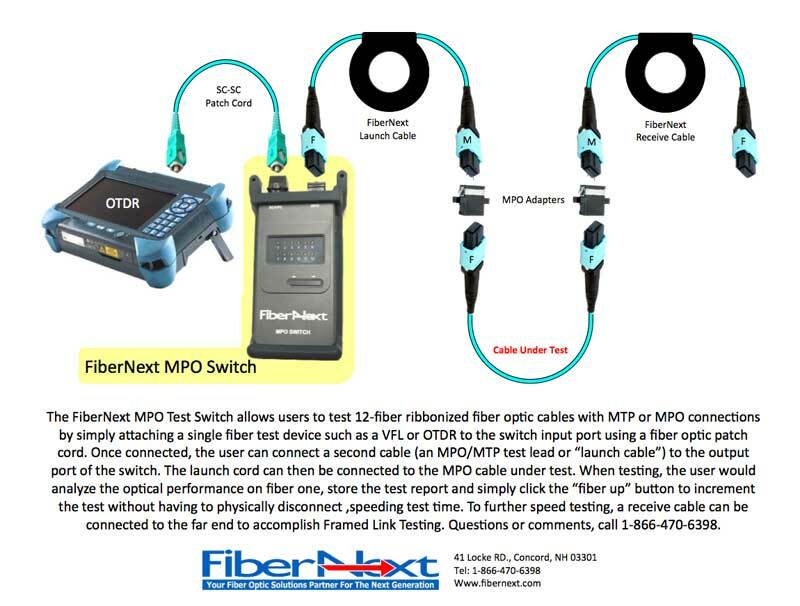 Fibernext has introduced a portable switch for testing multifiber MTP/MPO connectors. You can also watch the YouTube video here. 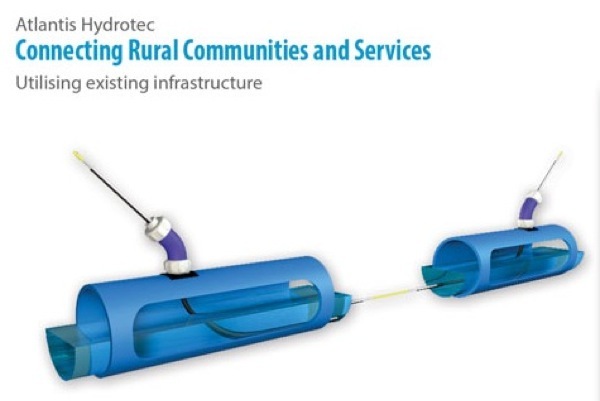 The Atlantis Hydrotec System provides an innovative and cost effective way of running fibre optic cable through existing drinking water supply pipes, making fibre to the home (FTTH) or commercial premises simple, quick, cost effective and environmentally friendly. The Atlantis Hydrotec System provides an innovative and cost effective way of running fibre optic cable through existing drinking water supply pipes, making fibre to the home (FTTH) or commercial premises simple, quick, cost effective and environmentally friendly. This patented and WRAS approved system is made up of specially designed fittings which are installed into the start and end locations of the supply pipes. Microduct is then installed between the two fittings creating a gas-tight environment in which fibre can be installed without coming into contact with the water supply. Read more. As much as 70% of the problems associated with deploying fiber result from something as simple as dirty connectors according to JDSU. Telephony Online. As reported in the website "Community Broadband Networks," many municipalities are creating their own networks, including FTTH like Chattanooga and Clarksville, TN, etc. But in 19 of the US states, there are laws that handicap municipalities or outright ban their offering "telecom" services. (See the list of laws compiled by Optica here.) Obviously, these laws were passed to protect the (usually monopoly) telecom and CATV providers who do not want competition. But they also make it difficult or impossible for many areas to get broadband. Does anybody know if these laws prohibit a municipality from building a fiber network and then leasing it to an Internet service provider? Obviously, FTTH needs good lawyers too. Wanted, P/T, F/T Telecommunications Instructor for our campus in downtown L.A.
We are a 30 week college consisting of Copper and Fiber Optics as well Computer Hardware and Networking. Position is available immediately. Salary negotiable. Applicants should have experience in splicing fiber optic cables in the air, underground, and indoors. Additionally, experience terminating fiber with mechanical connectors, epoxied connectors, and fused on pigtails. Must have attention to detail when setting up splice locations, termination points, and general fiber optic construction. Prefer experience working in a production based environment for small to large projects and testing for acceptance, trouble identification, and fiber characterization. Additional preference given to applicants with experience using the latest equipment and that can adapt their experience to Spligitty Fiber Optic Services’ preferred processes. The ideal applicant(s) will have a good work ethic, be hard working, and willing to learn. Applicant must have a standard driver's license, a clean driving record, and pass a pre-employment drug test. Travel may be required in some areas. Apply by emailing Michael Hill at mhill@spligitty.com. Please provide your resume and a contact phone number.